Last Friday, the City of Seattle filed an official notice with the U.S. District Court that it had negotiated and ratified a new labor agreement with Seattle’s police officers. Judge James Robart, who oversees the Consent Decree, had previously signaled that he would not weigh in on the merits of the new contract until it was properly before his court. But now that it is, he wasted no time in making his thoughts known: this morning he issued an “Order to Show Cause” why he should not find that the city has failed to maintain full and effective compliance with the Consent Decree. 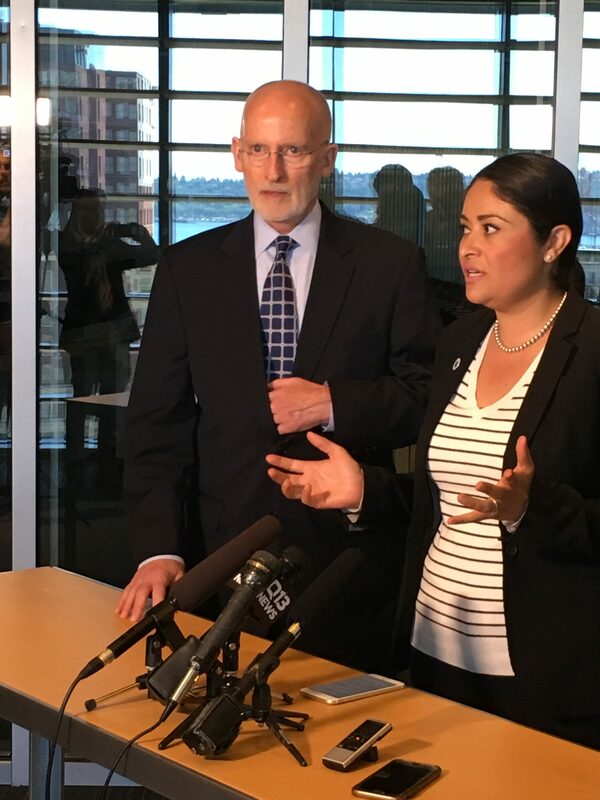 Last week, the City of Seattle submitted to U.S. District Court Judge James Robart a plan for evaluation and reporting over the next two years, as it works to sustain its compliance with the 2012 consent decree requiring police reforms. Today, Robart issued an order approving that plan. Back in January, U.S. District Court Judge James Robart ruled that the City of Seattle was in “full and effective compliance” with the consent decree that it signed with the Department of Justice over police misconduct. That declaration kicked off a two-year “sustainment period” in which the city must show that it can fully implement the remainder of its plan and remain in compliance with the consent decree. Last Friday, the City submitted its plan for what will happen over the next two years. A hearing that began this morning with U.S. District Court Judge James Robart kindly joking with Gonzalez, Council member Tim Burgess, and SPD Deputy Chief Carmen Best quickly turned into an opportunity for all parties — and especially the judge himself — to vent their frustrations. This afternoon, the Council will vote on enacting a “bias-free policing” ordinance into law, with one last-minute amendment to settle an argument from last week. The Seattle Times has published a 45-page memo from SPD to the City Council, responding to the 34 questions they submitted following the death of Charleena Lyles at the hands of two SPD officers. The answers are lengthy, and for the most part defy quick summaries as they dive into the nuances and complexities of the situation. SPD also refuses in many cases to speculate on what the outcome of the ongoing investigation will be. But the memo is an interesting and informative read. Today was the deadline for the DOJ and the current CPC to file comments with the District Court on the new police accountability legislation. They both did, and both recommended that the judge approve it.